Players have been complaining since Epic tasked them with killing 20 of these. Fortnite: Battle Royale players are convinced that Golden Ice Brutes are a myth. 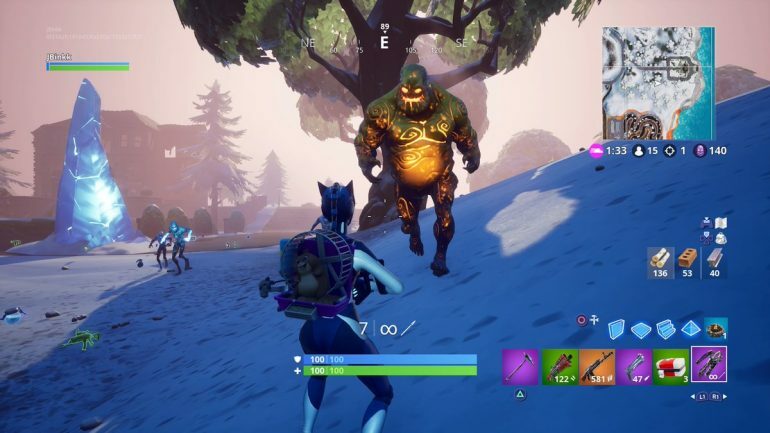 Developer Epic Games introduced an Ice Storm challenge yesterday that tasks players with killing 20 of these huge golden zombies called Golden Ice Brutes. They are part of all standard modes as the new horde of AI enemies players have to fight, which Epic named The Ice Legion. In this Legion of monsters, some creatures are in higher ranks than others, and it looks like very few Brutes rise to become the menacing Golden Ice Brutes. Fortnite players think more creatures should get there. Related: A cinematic made by a Fortnite fan shows the backstory of the Ice Storm event. The problems regarding this challenge with Golden Ice Brutes could be due to many things. The Ice Legion spawn areas are limited to where the ice spike structures they spawn from appear on the island, which means they’re only found next to them. Finding these structures around the map would solve the issue if there weren’t four different kinds of creatures that can spawn from them with different probabilities. The weak Ice Fiends and Wraiths will spawn very often, Brutes will spawn a bit less because they are stronger, and Golden Ice Brutes will spawn very rarely because they’re the strongest of the Ice Legion. Finally, we have yet to understand how Golden Ice Brutes spawn and if players can manipulate this at all. Players are trying to figure out if they only spawn once per area, or if they’ll eventually appear if you keep waiting around the ice spikes while killing weaker enemies. It’s also possible that they won’t spawn in every ice spike. Some players claim to have found success in manipulating the spawn of Golden Ice Brutes. YouTuber KRNG Chris shared a video claiming these creatures spawn at random after you destroy an ice spike. However, it’s not a guaranteed spawn. Other than that, we are not sure if they also spawn from ice spikes that are still standing. Lacking information about where to find the ice spikes of The Ice Legion, the odds of Golden Ice Brutes spawning around ice spikes, and if it’s possible to manipulate these odds are what make this Ice Storm challenge nearly impossible to complete in Fortnite. Developer Epic Games has yet to address this issue publicly.